So this news tidbit stopped me on my tracks!! 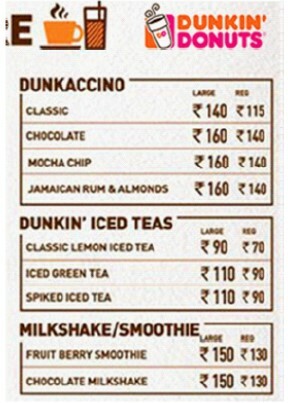 Dunkin Donuts closed shop on nearly half of their stores in India!! They had started with great fanfare in 2012 and used the same franchise with which they launched the Domino’s Pizza chain in India. But this time, Dunkin Donuts did not catch on! For starters, the unhealthy sugary and oily donut franchise targeted young adults comprising college students and young kids, who were already successfully targeted by McDonald’s, KFC and other fast food giants. But even these chains too were forced to cater to Indian taste buds and palates by spicing up their bland items, and offered altogether new items such as McDonald’s paneer wrap and other spicier offerings. KFC with its fried chicken mainstay appealed to the chicken-gorging Indians. The donut items were priced for youngsters from affluent homes or for working folks with disposable incomes to spend on these not entirely healthy fares. 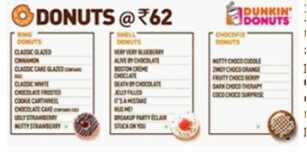 Typical steamed-milk-added coffee, appropriately named Dunkaccino, was priced at Rs 160, and a single donut was at Rs. 62. But still, where did Dunkin slip? Theirs is the only franchise that did not catch on in India. Remember, fast food business is a cut-throat business. Working on thin margins, they depend on volume in sales to make a profit. A recent story in the Economic Times cited several reasons. First and foremost, Indians were not used to a grab -and-go breakfast culture. Even if you drive to work, it will be difficult to eat while driving on Indian roads. In the chaotic and unruly Indian traffic, not only pedestrians, but also other 2-, 3- and 4-wheeler vehicles do not follow any traffic rules. Already, young Indians have enough distractions while traveling, like texting and messaging on their iPhones, and talking to their buddies. You can add one more item to this multi-tasking group at great peril with accidents. Second, Indian prefer to sit down and eat a hot breakfast at home before leaving for work. The top 10 Indian breakfast items include such fare as Idli, Dosa, Upma Poha or Aloo Paratha, none of them sweet. Older adults prefer oatmeal with dahi or buttermilk or the more traditional ragi-based porridge. Dunkin tried to tease the Indian palate again by introducing mango and lychee flavored donuts but these still did not produce the magic of burgers and pizzas. This entry was posted on April 7, 2019, 6:01 pm and is filed under Current Issue. You can follow any responses to this entry through RSS 2.0. You can skip to the end and leave a response. Pinging is currently not allowed.